Hoverboards of various designs have captured the imagination of kids for quite some time. Mobility devices like the Segway were supposed to revolutionize transportation and city planning, perhaps replacing cars with somewhat ridiculous 2-wheeled vehicles. Maybe someday self-balancing mobility devices won't be some kind of joke. We might have to wait until all the patents expire, though. Back in January, we wrote with some concern over the news that US Marshals had seized a bunch of one wheel scooters that everyone wants to call hoverboards, even though they don't hover. 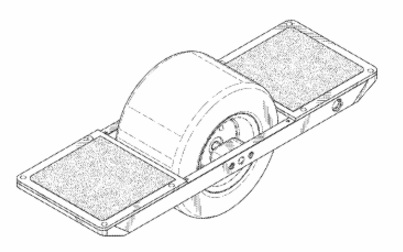 The case involved a US company, Future Motion, that had gotten a lot of attention (and a utility patent and a design patent) on such single-wheel balancing scooters. Future Motion then sued a Chinese firm, Changzhou First International Trade Co., that was making a product that certainly looked similar. Changzhou was demonstrating its product at CES in Las Vegas, only to have the US Marshals raid its booth and seize all its products based on a 7 minute hearing in front a judge where Changzhou didn't even get to present its side. And now that Changzhou has attempted to present its side... Future Motion turned tail and ran, ran away. It flat out dropped the case once it was clear that Changzhou was going to challenge the lawsuit. In fact, Changzhou is so up in arms over this that it's not accepting the case being closed and has asked the court to reopen the case so that it can seek attorney fees from Future Motion. Moreover, Future Motion directly relied upon its baseless TRO to obtain additional financial backing for itself. On February 3, 2016, Future Motion announced that it had obtained $3.2 million in additional funding for its business.... One of the stated bases for obtaining that funding was that Future Motion "vigorously protects its Intellectual Property as it protects safety and a ride experience that cannot be replicated by knock-offs."... Interestingly, Future Motion dropped this lawsuit against Changzhou on February 4, 2016 the next day after announcing it obtained the new funding. It is now apparent that Future Motion's actions were conducted with full knowledge that that the asserted patents... were non-infringed and invalid.... Future Motion undoubtedly sought the TRO and preliminary injunction with the expectation that Changzhou would not fight back in this litigation, and therefore would not discover the fatal flaws in Future Motion's case. Unfortunately for Future Motion, Changzhou did fight back. Upon reviewing Changzhou's opposition and supporting declarations, Future Motion simply gave up, filing a voluntary notice of dismissal. Even then, Future Motion only offered to dismiss without prejudice despite the uncontroverted evidence that the patents in suit were non-infringed and invalid. And this is why we're supposed to have an adversarial process in court, folks. Whichever side you come down on, it's ridiculous (1) that without even hearing the other side, the court simply ordered that the CES booth be raided and all products and other supplies be seized and (2) that the US Marshals got involved and seized the product. Future Motion is claiming that it's dropping the lawsuit because "it had been outgunned" and that following through on the court case would cost too much. But that's ridiculous since it was Future Motion who filed the lawsuit in the first place. Those claims really do suggest that it filed the case for one reason only, which was to shut down a competitor, and then it also got a bunch of free publicity out of it. Maybe the company has a case, but if it wants to argue infringement it should have to make its case in court, not simply use the filing as an excuse to shut down and embarrass a competitor with no repercussions at all if the original claims were exaggerated or simply false. Flying machines have been with us now for a little over 100 years. We still don't have flying cars clogging up the skies, but that's probably not such a bad thing. However, we still have a bunch of folks trying to improve upon flying in various ways. All kinds of quadcopters appear to be the trendy way to get things in the air nowadays, but we still have quite a ways to go before we're flying as gracefully as birds. The movie Back To The Future II takes place in 2015... so now that we've already arrived in 'the future' -- how have we done? We don't have flying cars (DeLorean-styled or otherwise) unless you count one-off hobbyist replicas that just kinda hover a bit. We could be on the cusp of getting hoverboards that actually work (but not on water, nor on any other surfaces besides a non-ferrous metal). Fax machines are still around, but not quite as popular as Back To The Future might make them look. If you liked this classic 80s movie, check out a few of these links. Until quantum levitation and room temperature superconductors are a practical reality, we're still without hoverboards and flying cars. The future has promised everyone some kind of hovering transportation, but we'll just have to be patient and wait for the technology to be refined and made economical, right? Here are just a few hopeful links to getting your hovering fix sooner rather than later. The Segway was originally billed as a revolutionary new way to travel, but after it was revealed, it didn't seem anywhere near as cool as a flying car (or hoverboard). While everyone is more concerned about gas mileage nowadays, there are still some dreamers out there working on personal flying vehicles. Here are just a few examples of some ways to get yourself off the ground. If you have some more free time, check out this unrelated (but not entirely random!) Techdirt post.